One of my favorite things about blogging what I cook is that I can always go back and figure out how to make it again! An eternal record to some of my favorite things to eat. Also, if we’re having people over, my husband can look through the blog and say “hey make this!” So that was off subject, but I did take a break from blogging for a while, because sometimes you just want to throw something together without measuring and taking pictures! But after a few, how did I make that? 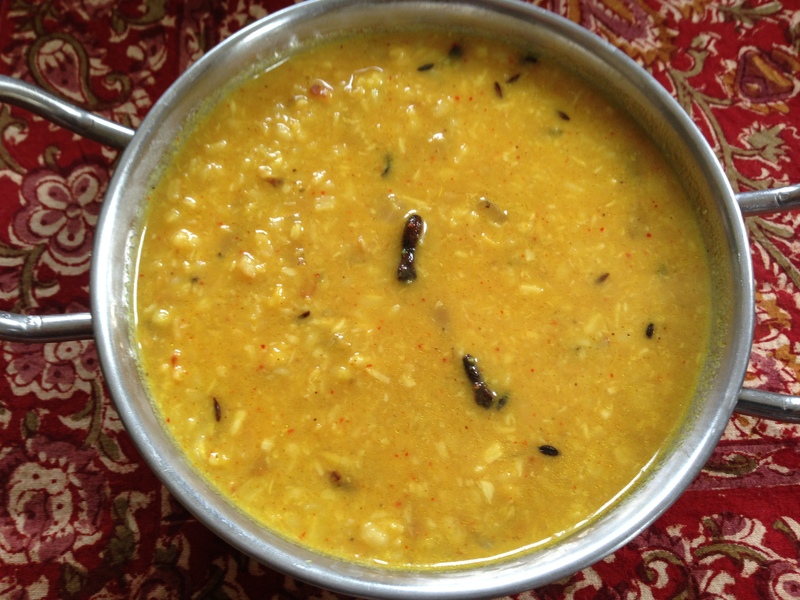 I’m back 🙂 Here’s another dal, very tasty and unique using mustard oil and coconut. The cinnamon also lends a nice flavor. Dry toast the yellow moong dal until a deeper golden color. Heat mustard oil in a pressure cooker. Add onions and saute until a little browned. Throw in the dal, coconut (if using frozen, no need to defrost), turmeric, and 4 cups of water and pressure cook for 5-7 minutes (I bring the pressure cooker up to pressure on high, then turn to medium, and run under cold water to get the steam out before taking off the lid). Add chili powder, cinnamon, mace, jaggery, and salt. Heat the rest of the mustard oil in a tadka or other small pan. Add the cumin and once they start to brown add the cloves and red chilis. Throw into the dal. Voila!